Now that we’re a month into the season, things are about to get real. For the first few weeks there hasn’t been a whole lot of movement in the small school rankings. Unfortunately this year it is partially due to an inordinate amount of games being canceled due to weather, but for the most part the reasoning has been that it is too early to start dropping and skyrocketing teams based on a few weeks’ results. The sample size of games has been simply too small. A great deal of research is made in developing the preseason projections and a Chicken Little philosophy based on an early bad weekend or a strong showing out of gate makes for a bad foundation for the rest of the season. The rankings are (or at least should be) a projection of who the best teams are and who is the most likely to be dog-piling after the final out is made in the championship game; not a who’s hot and who’s not radar. It’s not fair to the teams to have them jump from the ranks of the “receiving votes” category to the top ten because they won a hotly contested series, only to dump them down the next week after they don’t live up to inflated expectations. Likewise it’s unreasonable to dump a highly ranked team because things didn’t click from the first pitch of year. With that being said, the faults of the first few weeks have been under-scrutinized. It’s easy to rationalize a lackluster record in early March if it is believed that the team is underachieving. It’s also effortless to overlook a shiny, undefeated record of a club which has been feasting on underwhelming competition, but that stops now. Going forward, if a team is in the top 25, they will have earned it on the diamond. The game is afoot and it’s time to get dirty. Through the first month of the season Tampa unquestionably has been the team to beat in D-II. The Spartans went a record breaking 54-4 last season and could actually even be better this year. After outscoring their opposition 119-48 and compiling a 13-1 record in February, UT started March with a win over the Philadelphia Phillies in an exhibition game. Tampa is earning their wins over some quality teams as well; while their victories haven’t exactly come against a murderer’s row of opposition, their schedule hasn’t consisted of the D-II hardball equivalent of the Washington Generals either. Nonetheless, the next few weeks will really show how good the Spartan team is as they begin Sunshine State play, as well as tangle with some top out-of-conference teams including 2012 national champ West Chester and the always-formidable Valdosta State. Inserting themselves into the middle of rankings this week are Angelo State and Florida Tech. The Rams have rebounded from a disappointing 2014 season in which they narrowly escaped their first losing season in school history. Their resurgence comes in large part to the introduction of JUCO transfer Steve Naemark into the starting rotation. In five starts this season Naemark has struck out 44 batters while only allowing 20 hits and six walks. The staff as a whole has been absolutely dominating, only allowing opposition to a .229 average while fanning 40 more batters than they’ve allowed a hit to (146 to 106 in 124 innings). The Panthers were the last team out of the rankings last week, but left no doubt about their inclusion this time. They added a lopsided victory over Florida Southern to their already impressive early season résumé which includes wins over USC Aiken and Southeastern, a top NAIA team. With their addition to the rankings it gives the Sunshine State four teams in the top 20, with Nova Southeastern being the final team in the quartet to be mentioned. Columbus State and Chico State are two clubs that fell out of the top 10 after slow starts. They’ve been given the benefit of the doubt so far based on potential, but need to start chalking up some W’s to show they belong. Chico has a big series this weekend with archrival UC San Diego and the Cougars have a tough midweek opponent in West Florida. Missouri Baptist remains the top team in NAIA, but the door has been opened for another club to usurp the No. 1 position as MBU suffered their first loss of the season. The Spartans have also only played two games over the past two weeks due to cancelations so their armor could be a little rusty next time they take to the diamond. Their next games are at home against Lindenwood-Belleville who is 1-9, so on paper it looks like a good tune-up series, but the Lynx have played one of, if not the toughest, schedules to date. Faulkner and Oklahoma Baptist, who traded second and third ranked positions, each continue to nip on the heels of MBU. The Eagles very well could be the most talented team in the NAIA and recently had shutout wins over Judson and Lindsey Wilson. The Bison have been cruising with a perfect 14-0 record and are batting.398 as a team, but haven’t played any ranked opposition as of yet (their last two wins came against Southwestern Assemblies of God University). They won’t face their first ranked opponent until late March when they play Oklahoma City. New to the rankings this week are the Campbellsville Tigers who replace the struggling current national champ, Cumberland. The Tigers annihilated St. Francis over the weekend, outscoring the Cougars 43-2 in a three-game sweep. Once again, and hopefully for the last time, the D-III game cupboard was rather bare. However, there was a bit of a shakeup following the games that were played. For the first time this season a team has been supplanted at the top of a small school rankings list. Emory went 1-2 on the week to drop from the top spot. With second ranked UW-Whitewater still gameless on the season, it was Birmingham-Southern who leap-frogged the Warhawks into the top position. 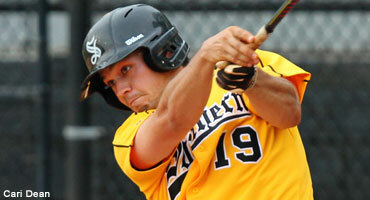 BSC took three games from Oglethorpe to raise their record to a perfect 8-0. The pride of the Panther staff has been senior Blake Stevens who continues to be one of D-III’s most dominating pitchers. After finishing 2014 with a 1.02 ERA, Stevens is putting up incredible numbers once again. In his three starts he has pitched 18 innings while only giving up nine hits and four walks with 25 strikeouts. Should he and the rest of the staff continue to hold down opposition, the Panthers’ reign at the top of the rankings could be a long one. After falling out of the rankings the first week, the Concordia Tornados reclaimed their spot in the top 25 after going a perfect 4-0 coupled with a continued slow start by Linfield.